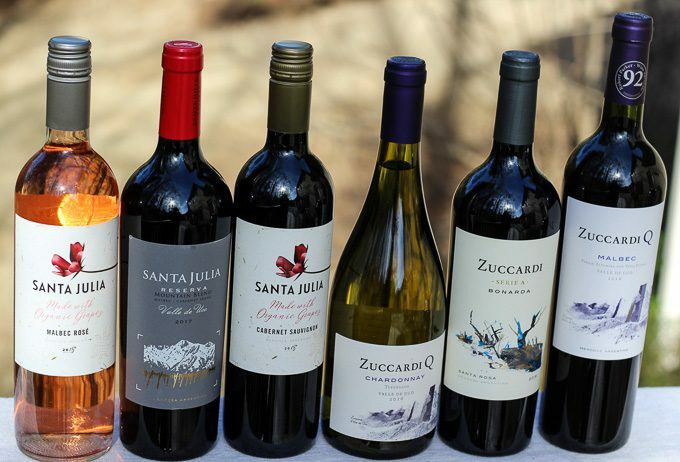 A sampling of Argentine wines provided by Winesellers, Ltd. This month the Wine Pairing Weekend group of bloggers is traveling (virtually) to Argentina. Thanks to Winesellers Ltd. for providing some of the group with wine samples. Join our Twitter chat on Saturday, January 12th at 11:00 am ET for our Argentine food and wine discoveries. Generally speaking, color matching your wine and food can lead to a good pairing. Lighter colored foods pair well with lighter colored wines, as do darker foods with darker colored wines. How your food is cooked can determine the flavor intensity. Roasting food brings out richer and sweeter flavors in vegetables, pairing well with wines that have some oak aging like Chardonnay or red wines. Steaming or sautéing keeps the flavors light and bright, pairing well with lighter or mid-weight wines. Braising develops a depth of rich flavors, pairing well with heavier red wines. Pairing a wine and food with similar characteristics like herbal green flavors that can be found in Cabernet Sauvignon, Cabernet Franc, and Merlot to green leafy vegetables and green tasting cruciferous vegetables. Balancing the weight (alcohol level) of the wine to the weight (richness) of the food. Fruit forward and lower tannic wines pair better with spicy foods. Combine bitter greens with a protein or starch for balance. Remember these tips work together, how you cook the vegetables and what other ingredients go into the dish influence your wine pairing selection. Disclosure: The wines were provided as media samples, all opinions are my own. Medium straw in color. Medium body and acidity. Notes of citrus, tropical fruits, toast, chalk, and a hint of yeast. Lingering finish with nice overall balance. 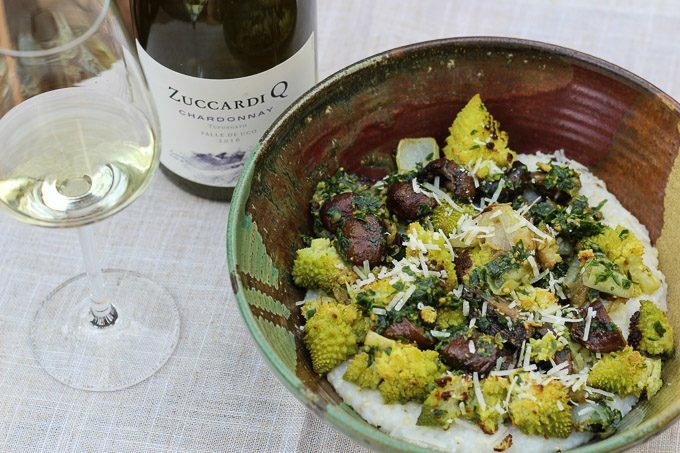 Food Pairing: Roasted Romanesco, Mushrooms, and Onions with Polenta tossed with an herb, lemon, and caper sauce. This pairing hit a number of the tips above. Lighter colored wine and food, roasted vegetables paired with an oak and sur lie aged wine, the weight of the wine and food in balance, and the acidity in the wine matched the herb, lemon, and caper sauce. Medium purple in color. Medium bodied, medium- tannins, and acidity. Notes of vanilla, violet, blackberry, black cherry, blueberry, and herbs. On the palate a soft, smooth texture. 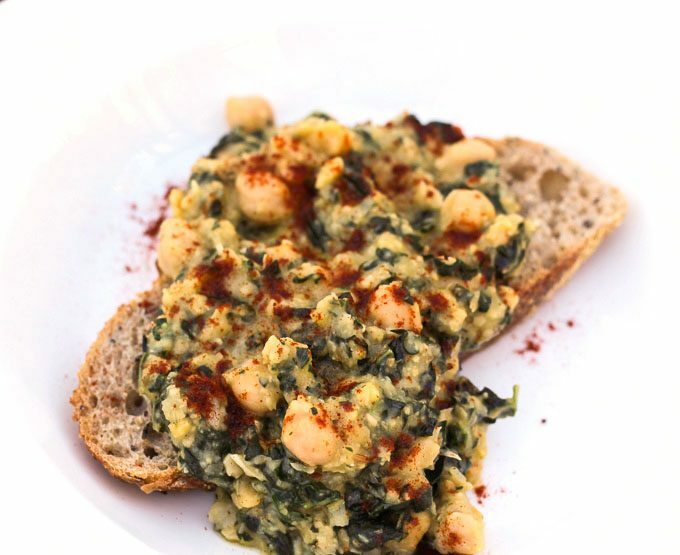 Food Pairing: Olive Oil Braised Chickpeas and Kale Toasts with Smoked Paprika. The slow braise of the chickpeas and kale paired well with the heavier more complex Malbec. The slight bitterness of the kale was mellowed out with the cooking method and balanced with the chickpeas and their creaminess, also a velvety characteristic found in the wine. The smoked paprika added an earthy like element that married beautifully with the wine. The Malbec also paired nicely with Vegetarian Chili. The hint of spiciness was balanced with the fruity characteristic of the wine. The braising of the vegetables added a depth of flavor that also was matched in the wine. And finally, the creaminess of the beans was echoed in the wine. Medium purple in color. Medium bodied, tannins, and acidity. Notes of vanilla, violets, blueberries, black cherries, and baking spices. Nicely balanced. 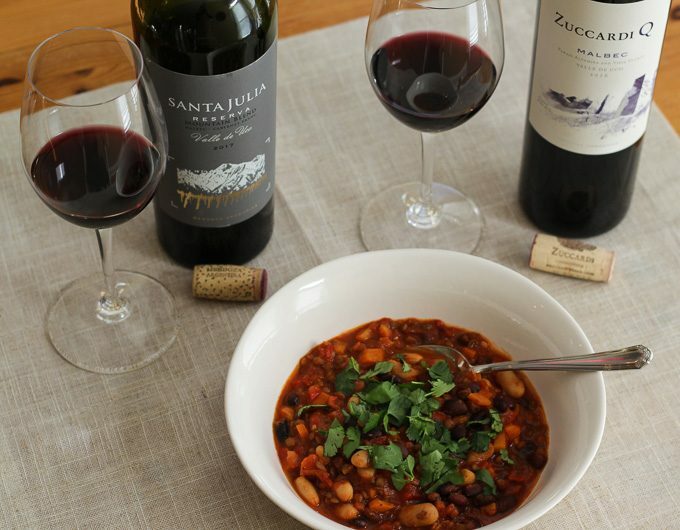 Food Pairing: The chili brought out more of the earthy and green characteristics in the wine. The fruitiness in the wine was a nice balance to the hint of spice in the chili. The acidity in the wine matched the acidity of the tomatoes in the chili. Line a rimmed baking sheet with parchment paper, toss romanesco, onions, and mushrooms, 2 tablespoons olive oil, and 1/2 teaspoon salt. Roast until brown, stirring occasionally for 30-35 minutes. Meanwhile in a large pot, bring 6 cups of water and 1 teaspoon of salt to a boil. Slowly whisk in the polenta. Turn heat down to a simmer, stirring often until polenta has thickened, about 5-10 minutes. In a mini food processor, pulse 2 tablespoons olive oil, parsley, thyme, pine nuts, capers, lemon zest, lemon juice until parsley is minced. Add to roasted vegetables and mix. To serve; spoon polenta into a wide shallow bowl and top with roasted vegetables. A satisfying vegetarian main course paired with an Argentine Malbec. Thinly slice 4 garlic cloves and half the remaining clove. In a medium pot over medium high heat, add 1/2 cup olive oil. Add the garlic slices and sauté until just golden, about 3 minutes. Add the cumin seeds, salt, red pepper flakes, and shallot slices. Cook for about 2-3 minutes. Stir in the kale, chickpeas, and chicken broth. Cover pot and reduce heat to medium-low. Simmer for 15 minutes. Toast the bread slices and rub with the garlic half on both sides. In a wide shallow bowl, place the bread slice and spoon the chickpea mixture over the bread. Drizzle with olive oil and sprinkle with smoked paprika. My favorite Chili, perfect with an Argentine Malbec. In a medium soup pot over medium heat, add olive oil. Add the onion, carrots, bell pepper, garlic, chili powder, cumin, and black pepper. Cook stirring for about 15 minutes or until vegetables are soft and tender. Stir in the chipotle. Turn the heat to high and add the tomatoes and their juice. Bring to a boil, stirring and crushing the tomatoes. Reduce the heat and simmer for about 20 minutes. Add the lentils, beans, 14 oz. of water, and salt to the pot. Bring to a boil, lower the heat and simmer for another 20 minutes. Add more water if it gets too thick. 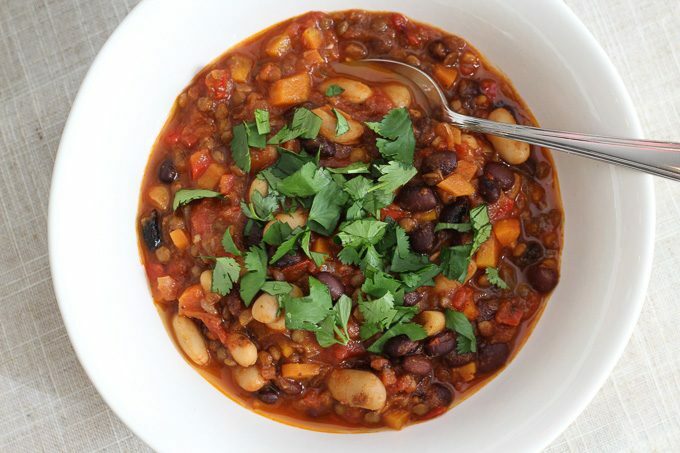 I love vegetarian chili and a fresh, cooler climate Malbec from Argentina is a terrific pairing!! I’m definitely going to make the recipe-thank you:) Cheers! 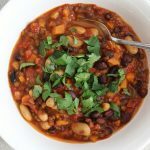 This is my favorite chili recipe with or without meat. What wonderful and inventive pairing combinations! Yes, it doesn’t always have to be meat. Particularly like the romanesco recipe, as I always want to buy it when I see it but don’t know what to do with it. Makes a lot of sense with chardonnay and pine nuts…mmm….. I hope you try it and let me know how you like it. Jane, I love your lessons about how to pair vegetarian food with these wines. You’ve got some serious cooking chops and I love reading your posts. I think I’m doing a big, fat tray of roasted veg tonight with Polenta (I always forget about polenta for some reason.) Cheers! Thanks Liz! Yes polenta and roasted veggies is an easy winter comfort food dinner with a glass of wine too. I recently roasted a bunch of root vegetables on a sheet pan, they would have fit right in with your choices here. I am always sad to see summer veggies go out of season, but those winter root veggies for roasting make for some awesome red wine pairings. Your vegetarian choices looks delicious and sound great with the wines. Nice options. Thanks. Thanks Michelle, it is amazing how flavorful vegetarian food can be and fun to pair with wine. I love your pairings! And the idea of paring reds with vegetarian fare! 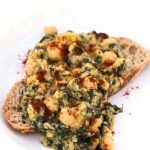 Need to try your olive oil braised chick pea recipe! 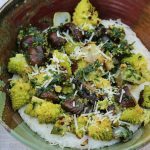 Everything looks delicious but the romanesco with polenta has particularly caught my eye! Great tips Jane! I would probably make more vegetable centric meals in the winter with more ideas for pairing them with the big red wines we tend to go for in this season.